The MNR description indicates a public access point just above Bannerman Dam on the lake. Previous paddlers have reported a tentsite on one of the islands at the end of the narrows between Lower Onaping Lake and Onaping Lake (UTM 592938). It is described as pretty and well-used. The island is thickly covered with red pine and spruce, with a small landing beach on the south end which is reportedly excellent for swimming. P 64 m L around the east side of the dam, just east of the helipad. Flowing south from the dam, the Onaping River runs through a low-lying area. The shoreline is marshy and the river is weedy and shallow. Approximately 2.4 km downstream, the river widens into Kasakawawia Lake. The marshy shoreline continues and there are two small rocky islands in the middle of the lake. If water levels allow, canoes can be paddled and waded upstream to the base of a chute under the bridge where a bush road crosses the river. The 91 m portage goes to Bennet Lake. In low water conditions, a longer portage may be required and previous paddlers have reported a moderate 760 m portage located on the south shore 90 m past a hunt camp. A hunt camp is seen on the north shore of Kasakawawia Lake as it begins to narrow. There is little change in the surrounding shoreline, even though a slightly higher elevation is achieved. Red pine and spruce with sparse poplar forest the western end of Bennet Lake. Continuing east, the north shoreline becomes marshy while the southern banks become thickly vegetated. Bennet Lake is approximately 2.4 km in length and there is very little distinction between it and Kawawia Lake, which lies to the east. Entering Kawawia Lake, a marsh is immediately encountered, continuing into Friday Creek and through to Friday Lake. A large island is situated in the centre of the lake, with the route lying north of the island. The route runs almost directly north from Kawawia Lake for approximately 4 km on this creek. Only broken beaver dams were encountered along this stretch. A liftover is required where the road crosses Friday Creek and the creek enters the first of a chain of small lakes. In June, the section of the route from Bennet Lake through to Friday Lake was easily paddled, with sufficient water. However, Friday Creek is quite shallow and canoeists may run into difficulty depending on the water level. Friday Creek widens into several smaller lakes which are almost as shallow as the creek itself. this portage can be avoided by wading up the creek to the south end of Friday Lake, where a liftover is required. However, the current is swift and the rounded, rocky river bottom provides poor footing. The portage is recommended, and is rated moderate. The predominant change in the shoreline vegetation occurs at the bay in the southwest end of Friday Lake. The rocky shores are felsic intrusives and metamorphics from the early Precambrian period. Poplar and spruce are abundant along the rocky shoreline. Friday Lake is approximately 7.2 km long. The western shoreline is relatively steep while the eastern side is marshy in spots with a more gradual rise in the height of land. Both Friday Lake and more northerly Scotia Lake are long narrow lakes which have pooled in the Sandcherry Creek Fault. Although it may be possible to shorten the portage by paddling upstream in high water, this was not possible in late June and there were no indications of any side trails from the creek joining the main portage. Scotia Lake is approximately 15 km in length and another change in topography and vegetation is noticeable. White birch and poplar are abundant on the high hills which flank this long, narrow lake. A fly-in fishing lodge is located midway up the lake on the east shore. There may be potential campsites on the north half of the lake on the east shore. The Wanapitei River flows north out of Scotia Lake. For the first 1.2 km the river is wide and the shore is lined with numerous deadheads and logs. P 30 m on an island in the middle of the river. This portage is necessary at the end of this wide stretch of river to bypass an old logging flume. Watch for nail spikes protruding from the logs at the base of the portage. For the next 3.2 km the river is extremely narrow but quite deep and easily navigated. There are two short sets of rapids in this stretch which are not marked on the topo map. 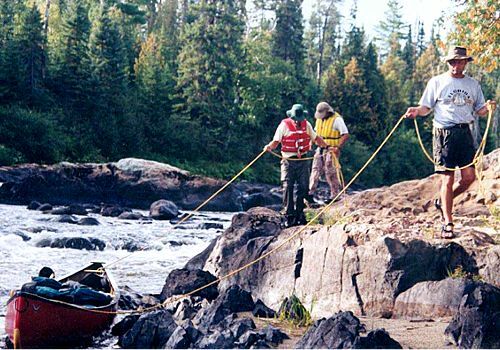 A liftover is required to cross a log boom at the top of the rapids. The rapids were run with no difficulty; however other canoeists report that there is a portage bypassing them. P 799 m beside a camp located on the east side of the river. It is believed that this portage was created for paddlers coming upstream to this camp so it is probably not required. It is reported that there is a campsite at the end of this portage, about 1.2 km south of Kalico Lake on the river, in a low,swampy area surrounded by tag alders and aspen. It is mainly grassy, with room for one large tent. Another change in vegetation belies the change in geology as precambrian rock gives way to sand, gravel and clay. The vegetation of the next 3.2 km stretch of river is extremely dense and overhangs the river. This factor alone represents a hazard in a few spots. Cedar and tag alder are prominent, with pine and poplar found along the high river banks. The final stretch, about 1.2 km in length leads into Kamenisa Lake and flows through a low lying marshy area. Kaminisa Lake is approximately 2.4 km long with poplar and pine the major vegetation on the east shore. The west shore is predominantly white birch. The north end of this lake is shallow and marshy where Lady Fair Creek enters. The next 300 m is through a river channel into kalico Lake. White birch is plentiful while red pine and spruce cover the west shore. Kalico Lake is about 2.4 km long. The south end is rimmed by a rocky shoreline, but to the north very little rock is noticeable and white birch surrounds the lake. Fishing for pickerel and lake trout is reported to be good. From this point until the river ends a Wanapitei Lake, the river varies in depth from just inches to over six feet. the 2.8 km stretch flowing into Oshawong Lake is spotted with four or five sets of small rapids, featuring boulder and log obstacles. Late June, water levels were just sufficient to get through. However, lower water levels have required that canoes be lined through for a 1.6 km stretch. Cedar overhangs the river the entire way from the railway tracks to the lake, with black spruce and tag alder crowding the banks. There are numerous deadheads and hidden rocks in this section and caution should be used. The river flows into and drains out of Oshawong Lake at the north end. P 59 m on southeast bank of the river. It is the first of two portages which bypass waterfalls. It is approximately 400 m past Oshawong Lake. P 130 m R around two small waterfalls. This portage is about 200 m beyond the previous one. After leaving the second portage, a 17.6 km stretch of marsh begins. The first 8 km is called Esker Lake, but the water never exceeds three or four feet in depth and the shoreline throughout is rimmed by swamp and marsh vegetation. High hills of rock and jack pine are quite noticeable far back from the lake to the northwest. Fishing for pike is good. The winding, meandering section following Esker Lake is easily navigated by reading either the direction of the current or the direction of the underwater grasses. On a hot day it would be nice to get this paddle done as early as possible in the day, since there is little relief from the sun. P 90 m R. this mandatory but easy portage is located at a sharp bend in the river just before the river narrows into a gorge. The trail ends on the upstream side of the Bailey Bridge. The next 3 km of the Wanapitei loses 15 m (50 ft.) of elevation, creating several mandatory portages and several runnable rapids as the river traverses mid-Precambrian conglomerates, sandstone and siltstone. In late June, it took three hours to work this section of the river, which is noted on the topo map as Conglomerate Chutes. However, later on in the summer, with a much lower water level, others have had to line, pull and manoueuvre canoes around the rocks exposed by low water. In late June, two sets of runnable rapids were encountered prior to the first portage in this section. P 80 m R around a waterfall. This portage is located about 1.2 km downstream of the Bailey bridge. It is rated easy. Following this portage, there are two more sets of runnable rapids. P 274 m R around a long class 3 rapid. This rapid is not indicated on the topo map. Three or four more short class 2 rapids follow this portage, with just sufficient water in June to run. Following this tricky section, the river returns to a meandering marsh and continues for approximately 8.8 km. Moose, loons, beaver, bitterns and herons were sighted in this section. Others report sightings of bear and otter in this area as well. Upon leaving this low-lying section of the river, the topography and surrounding vegetation change dramatically. High clay banks line the meandering river and vegetation consists mainly of white birch, poplar, spruce, balsam, rid and jack pine. Navigation through this section posed no difficulties and water levels were sufficient for easy paddling. For the next 24 km, paddling is quite enjoyable, with a chance to see verio0us species of wildlife around every sharp bend of the winding river. There are no required portages until the log jam located upstream of the remains of an old sawmill. The next section has several small log jams which may require liftovers along the sandy banks. This will depend on the water levels. In June, only one liftover was required. A large open field on the east bank of the river (left side) is all that is left to mark an old sawmill. Just below this field, a windmill made from 45 gallon drums turns in the wind in perfect silence. Downstream, the river forks into two major channels, one to the right leading into Welcome Lake, and one to the left which the route follows. Three sets of rapids are found below this fork. The first of these includes a large log sweeper, three feet in diameter, lying fully across the river near the bottom of the rapid. It requires the canoes to be lined underneath it on river left. In higher water it may be possible to lift canoes and packs over the log to river right. The second set of rapids was run with no difficulty. P 100 m L around a rapid. This long, serpentine rapid ends at the Bailey bridge. Although the portage was not found, it is reported to be easy, following a bush road. It probably begins part way through the rapid. After this point, the river begins to straighten out, heading in a south-southwesterly direction to Wanapitei Lake along the Upper Wanapitei Fault. For whitewater enthusiasts, the remaining 48 km of the river is perhaps the most challenging, as more than 30 sets of rapids are encountered as the river drops 87 m (284 ft.). Portages have been cut around most of the major rapids. All portages identified in this section skirt rapids of class 1 to 3. All other bars shown on the topo maps for this section indicate Class 1 or 2 rapids. Several other Class 1 to 2 rapids are encountered which are not shown on the topo maps, but they were run with no difficulty in high water. 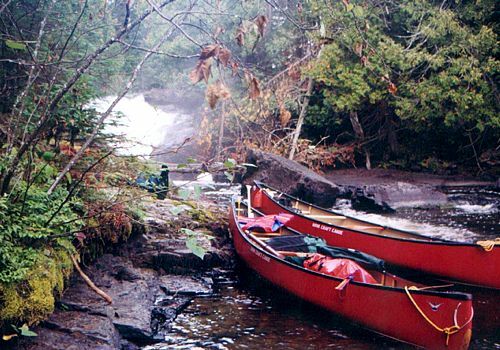 With the exception of the last portage, rapids become gentler as the river progresses southward. All portages south of the bridge in Howey township follow the logging road immediately adjacent to the river except for the final portage. Overall, many rapids in the remaining section of the river could be scouted from the canoe and were easily run with fully loaded boats. Eight tentsites were counted in this stretch of river. P 91 m R around two small waterfalls separated by two pools and an intermediate swift rapid. The portage on the west bank skirts a large ledge. P 182 m R around a rapid about 100 m past the previous rapid. The portage can be shortened by running the rapid to the pool above the falls and portaging on the left over the rocky banks to the base of the waterfall. After paddling just a few hundred metres further downstream, another rapid is encountered, marked as a bar on the topo map. It features a small rocky island followed by a ledge, with a significant log jam blocking the smaller channel on the west side of the river (river right). Canoes were unloaded and reloaded over rocks to river left to bypass the log jam. Then five paddle strokes take the canoeist to a portage on the east bank (river left) to bypass the ledge. This strenuous portage is only 91 m in length, but it is steep and rocky. There may be an alternate portage over the log jam and rocky island in the centre of the river. P 80 m over island about 1 km after the previous portage. The easy trial bypasses a rapid created by a large, rocky island in the centre of the river. P 600 m L (east bank) around a long, winding rapid. This portage is difficult to follow, with much deadfall. 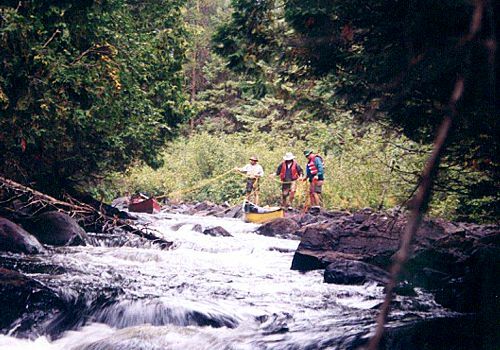 It required us to ford knee-deep Haentschal Creek midway through the portage in order to fully scout the rapid prior to running it. This class 2 rapid required manoeuvering, but it did not present any unavoidable, significant ledges. P 199 m L around rapids. This portage is about 300 m downstream from the previous set. Two ledges with large boulders at the bottom of the rapid make this a mandatory portage. P 151 m R around swift rapids. This is found about 800 m downstream of the previous set. It is rated easy. P 100 m L about 500 m past the previous set around a rapid. P 300 m L around a set of rapids with large boulders and ledges. This is a mandatory portage. It is found about 1.5 km past the previous set. P 151 m R around a rapid with boulders and ledges - a mandatory carry. The trail follows a bush road to the river bank. There are discrepancies between the MNR route map and the topo map with respect to the location of the bridge over the river in Howey Township. Disregard the MNR map which shows the bridge and campsite to be at the confluence of Burw3ash Creek, about 1 km south of its actual location. A short, easily run set of rapids is located at the bridge indicated on the topo map. A second set of rapids is encountered about 200 m downstream from the bridge and is indicated with a bar on the topo map. This bridge marks the beginning of a stretch of river which has a bush road immediately adjacent to it. More than ten logging trucks and other vehicles were counted along this stretch of road one day in June and all remaining portages, with the exception of the final one follow this road. Care should be taken when walking the road since it is a single lane and well travelled. Since it follows the winding river, visibility is sometimes limited. P 700 m along bush road around along, winding rapid with lots of rocks. This was run with no difficulty, and no significant, unavoidable ledges were encountered. P 91 m along bush road around swift rapids. P 182 m along bush road around a series of three ledges. A second portage on the west side of the river (river right) around these rapids has tent site potential. P 549 m along road to bypass a winding rapid. It was run with no difficulty. P 100 m along bush road around swift rapids. P 50 m along bush road around swift rapids. P 75 m (easy) on the west side (river right) to bypass two large ledges strewn with boulders. Over the next 4 km the river widens considerably - up to 450 m in places. An intermittent marsh is found here depending on the season. It is reported that fishing for bass, pickerel and pike is quite good here. Motorized fishing boats provided noisy accompaniment from this point on, although only a few cottages were not4ed. Old bridge piers are seen crossing the river mouth, marking the beginning of Wanapitei Lake. Formed by a meteor crater, Wanapitei Lake is roughly 11 km in diameter. However, a 22 km paddle is required to skirt the shoreline and take the paddler to the public access northeast of the bridge in Boland`s Bay and Hwy 541 to Sudbury. Travel on Wanapitei Lake can be hazardous in high winds and should not be attempted. An alternate stop at Rocky`s in Wanapitei Park on the north shore may be used. The trip diary below describes our annual guys trip for 2002. Ive paddled with this group the weekend after Labour Day weekend for the past 12 years. Once we deal with the inevitable schedule conflicts, the group size has varied from 6 to 8 in size. The group this year was our smallest ever  five people. Participants this year were Richard Munn, Alan Marcon, Peter Shuparski, Niel McKay and Gil Gasparini. The odd number meant that one person had to paddle solo. We were unable to locate a Royalex solo boat (and I was unwilling to even consider sacrificing my solo cedar strip) so we ended up using two 16 ft. Nova Craft Prospectors for the tandem boats and a 16 ft. Langford Prospector for the solo boat. In retrospect, the finer entry and exit lines of the Langford made it track a little too well, and it was not the best choice for the solo paddler. The problem was apparent sometimes in the whitewater sections, but mainly in the winding oxbows of the marsh sections of the river, when wrestling the boat around the frequent turns became a bit of a chore. None of our group are whitewater experts, but our years of paddling together have brought us to the point where we are comfortable paddling rivers like the Spanish, so we felt capable of handling the Upper Wanapitei in the moderate water levels we were expecting. We knew from the outset that we were not going to experience a rollicking whitewater run during the fall months. However, our research and contact with others who had paddled the river left us feeling comfortable that we would have adequate water to run most rapids and complete the 129 km run in five days. Rather than deal with vehicle shuttling on the logging roads that criss-cross the area, we decided to take the train up to the intersection of the tracks and the Wanapitei River at mile 45.1 just before Felix. From that point, the river would bring us south to our finish point on Wanapitei Lake through a number of distinct sections. The river begins with a section of flatwater river, then changes to a long section of curves and oxbows, changes to a long north-south whitewater run along a fault line, then finishes with a short flatwater section before ending on Lake Wanapitei. We took the transcontinental train (The Canadian) from Sudbury. We gathered at the train station an hour before departure time to get the canoes and gear ready to go into the baggage car. The train arrived on time, and at 3:50 pm we helped load our gear, found seats and settled in for the ride. In less than an hour we were stopped at the town of Capreol for 1 1/2 hours because there was some track work in progress on the line ahead. We wandered Capreol and went for a beer at a local watering hole, then resumed our trip at 6:00 pm. The ride on the train was short but enjoyable. We ate our brown-bag suppers in the domed observation car and watched the scenery speed by. Fifteen minutes before our expected arrival at mile 45.1, a steward came and escorted us down to the baggage car. We spent the remainder of our time chatting with a staff member from the train and two young women from England who were travelling across Canada from coast to coast on the train. They seemed a bit intrigued that we were getting dumped off in the middle of nowhere to begin our canoe trip. Frankly, were always a bit surprised too, to find out that a huge train like the Canadian will make hundreds of passengers in 25 rail cars sit and wait while 5 schmucks unload their canoes and gear for a canoe trip. At $15 per ticket and a freight charge of $20 per canoe, we consider it to be one of the best deals in existence! We arrived at our destination at 7:15 pm. We asked to be dropped of at Lous Camp just before the bridge over the Wanapitei, and the train crew seemed quite familiar with the concept of Lous Camp, as if it were a major metropolitan stop on the transcontinental route. The crew quickly passed down our gear and canoes and got on their way. They were in such a hurry to get going that they neglected to pass down the last small bag, which contained Peters fleece top and a six-pack of beer. If any railroad staff is reading this, you can keep the beer  just mail Petes fleece back to him, ok? but dont take it for granted that its a given that this offer will be made. We spent the remainder of the evening sitting around chatting. Lou came out and joined us for a beer while filling us in on all of the local lore. He is intimately familiar with the Wanapitei River, and gave us a lot of good advice. He did warn us that water levels had dropped significantly during the past week, which wasnt news that we wanted to hear. Throughout the night got an education in just how many trains go by on this section of rail line. We had a noisy and restless sleep as 12 more trains roared by at various times during the night. Each train shook the ground and sounded like it was 6 inches away from our toes as we lay in the tents. Surprisingly, there were still a lot of mosquitoes out. They were annoying both in the evening for about an hour and while we were packing up the next morning. We were up at 7:00 and on the water by 8:30 am. Lou came out to see us off and we headed down river. The first three kilometres of river were narrow, shallow and bouldery. At many of the twists and turns, cedar had fallen into the river and we had to negotiate our way around them. There was a lots of deadfall in the river, and we had to deal with three or four liftovers at small log jams and beaver dams. We cut through the northwest corner of Oshawong Lake and immediately exited the lake and continued down river. We did two short portages (around a small chute and a pretty staircase falls) and entered Esker Lake. The lake is long and narrow (basically just a widening of the river) and is about 10 km long. We were at the north end of the lake by 1:00 pm and stopped for lunch at a rough campsite. The site was unmarked in the trip notes that we were using, but was found on river left just before the power line crossing. It was not a great site by any stretch of the imagination, basically the end of an ATV trail down to the lake, but useable in a pinch. In a wandering, marshy area, any solid land is valuable. The blueberry crop on the site was simply amazing. None of us had ever seen blueberries that thick before. 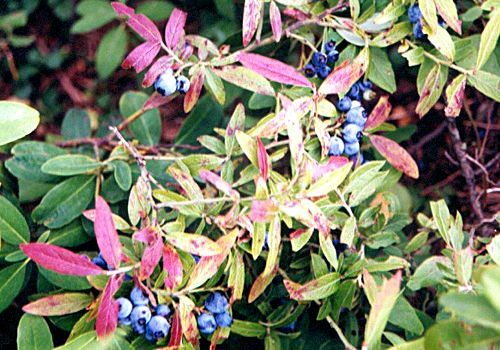 We were to find these bumper crops of blueberries at a number of locations along the route. The next 6 km of the river was twisty and windy - a marshy section of continuous oxbows. Vegetation was high and thick on both sides of the river  tag alders, high bush cranberries, and a variety of grasses and sedges. We arrived at a narrow, rocky gorge with a long rapid late in the afternoon. The river turned sharply to the left and tumbled down a set of rapids and small falls, very scenic. We located the short (100 m) portage on the left side, and carried down to the far end. A small campsite was found at the end of the trail adjacent to the Bailey Bridge over the river (km 21.5). The site itself was small and sloping, but it had a smooth rock takeout, and a reasonable firepit area. The only tent area we could find was a few steps down the road in a gravelly area right next to the logging road itself. Not exactly a five-star site and we were hoping that the logging trucks were finished running for the day, since they would be driving past ten feet away from our tents. Thankfully, the trucks were indeed finished, and the only people we saw that evening were a couple of ATV'ers who were lost and stopped in to ask for directions on the logging road. We had a great supper of Lipton Noodles and freeze-dried chicken with chocolate bars for dessert. We spent a short, relaxing evening playing euchre, and were in bed by 10:00 pm in preparation for a long morning tackling the rapids and fast water of Conglomerate Chutes the next day. It was a cold, cold night in the tents. We could see our breath in the morning as we emerged from the tents to make breakfast. The little thermometer I have clipped to my day pack showed a temperature of 4 degrees C as we rolled up our sleeping bags and stuffed our tents into the packs. Once again, we were on the water by 8:30 am and headed down river. Our goal was to make it to a campsite at km 51, so we had a 30 km day ahead of us. The three kilometre section following the Bailey Bridge is know as Conglomerate Chutes, and is an area of steady shallows, riffles, rapids and chutes. Our trip notes indicated that it would likely take about three hours to work our way through to the end, where the flatwater portion of our trip would begin. Our trip notes indicated that there were two runnable rapids in the first two kilometres of this section. When we arrived at the first of these drops, we began to realize just how much the water had dropped in the past week, and saw that we were in for a real low-water trip. Although they looked as if they would have been quite runnable in higher water, when we arrived they were quite bouldery and ledgy, to say the least. We lined the first and ran the second, but it was a bit of a bump and grind. Immediately after these rapids, we portaged 87 m on the right around a spectacular little waterfall (25 to 30 ft. drop). A good trail was present on the right side, but there was a very steep drop at the far end, and not much room at the put-in to reload and launch the canoes. The three-hour duration for traversing Conglomerate Chutes was accurate for us, as we were complete by 11:30 am. The only other marked rapid (supposedly a 300 m portage around a class 3 rapid) was never found. Presumably the water levels were so low that it was just a shallow rock garden and we simply waded through it. There were a few runnable rapids and parts of rapids, but the majority of the time was spent lining and wading endless sections of shallow, bouldery river. We were beginning to feel that Conglomerate Chutes were giving us a sneak preview of the rest of the river, a premonition that proved correct. The fast water section ended at that point, and the remainder of the day was spent paddling a 25 km section of oxbows through a marshy area. It was a scenic area with water plants and hundreds of flitting dragon flies, but a bit tiring, particularly for the solo paddler who had to wrestle the boat around the frequent sharp corners. We began to trade off and take turns in the solo boat at half-hour intervals to allow everyone to take advantage of the relatively easy paddling in the tandem boats. We stopped for lunch at a campsite on river right at km 36. The trip notes we had indicated that this site was unverified. We can confirm that the site was indeed there, but it was not a great one. Situated on the south shore, it was in a dense grove of cedars and pines, making it cool and shady. There was room for 2-3 tents in the bushy perimeter around the site. We chose to paddle another 25 m down river and eat our lunch in the sunshine on the riverbank rather than sit in the shady site. We did another 15 km of continuous oxbows through marshy area in the afternoon. We arrived at our planned campsite at km 51 at 6:30 pm. The trip notes indicated that the site was situated between the river and the logging road. That was an accurate, if understated description. I climbed the steep sand embankment (20 ft. high) and peered over the edge. There was a patch of flat beach sand at the crest, and a major logging road 20 ft beyond that. Sand makes for terrible camping conditions, and this stuff was as fine as talcum powder - the worst kind. We set up our tents into this sandy area and prayed that the logging trucks would stay away, or we and out gear would soon be covered in sand from the site and dust from the road. Besieged by mosquitoes, sandflies and ants, we set about making supper (tortellini with tomato-mushroom sauce). An hour later, supper was done, dishes were washed and the flies began to abate. There were a few ATVs that went past in the evening, but thankfully no truck traffic. That started at about 3:30 in the morning. There were six or seven trucks that roared by during the night, and it felt and sounded as if they were going to run over our tents. The fine white sand blew up in clouds and found its way into all of our gear, packs and clothing. For the next three days, we would be cleaning this sand out of tent zippers and the bottom of our canoes. The unanimous verdict was that this was the worst campsite our group had ever stayed at in twelve years of paddling together. The previous evening, we had joked that while the sand was bad, we should at least be thankful that it wasnt raining, which would have caused the sand to stick even more thickly to our gear. Of course, by saying this we had tempted the rain gods, and at 7:30 am, just as we were knocking down camp, it began to pour. Packing tents and packs in the downpour on the sandy site was a gritty and unpleasant experience. We were on the water just before 8:30 am with the plan to make it through the remainder of the winding flatwater section of river to the campsite at about km 80. The trip notes we had indicated several logjams in the first five kilometres, but we encountered none that required a lift over or portage. The major logjam expected at km 58 was indeed there, but a channel had been cleared on the left side and we paddled straight through. Near the confluence with Welcome Creek, there was another large logjam where the river split around an island. We tried at first to pull over the floating logs on the left side, but it would have required the agility of a log driver. It was apparent that one of us was going to end up swimming as we tried to wrestle the canoes across the mass of logs. We changed our plan and worked our way down the smaller right channel over the smaller pile of logs on that side. We ended up in a narrow, sandy creek and paddled and waded our way around the rest of the island and back into the main channel of the Wanapitei. There was a small runnable rapid immediately following this log jam, then a 9 km section of river with a number of swifts and small rapids. At km 70, we arrived at two marked rapids, described in our notes as a 100 m then a 200 m portage. The first was a small falls, and we simply lifted over a knob of rock on river right. The second was not runnable or lineable, so we took to the portage trail. The path was quite rugged, with a number of steps and gullies to hop over; and the trail was very narrow and faint at times. The overgrown state was advanced enough that a year of no traffic would clearly result in its complete disappearance. The next rapid (marked as a P 100 m on the right) was a couple of hundred metres downstream. The river split around a small island. The right channel was basically dry and jammed with huge logs. We ran a small drop on river left that lead to a small pool above the main. We portaged (a short liftover) over the small rock island, which involved a precarious balancing act across some huge logs that spanned a chasm in the rock and put in at the base of the chute. Just downstream we arrived at another island. We didn't inspect the channels on either side too closely, but they appeared to be very dry, and very rocky  not runnable. We portaged down the centre of the island on a nice, easy trail. There were some blow downs at the far end that involved a bit of heaving to get the canoes through. 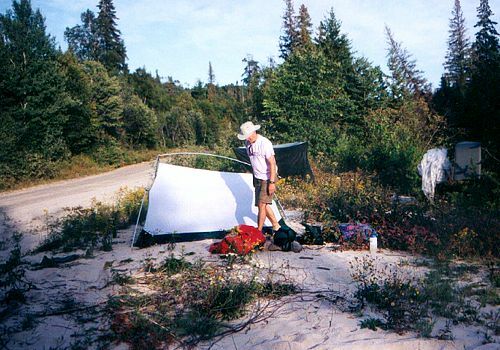 A nice campsite was found on the island near the centre of the trail. It would have held three or four tents easily, and had a large, neat fire pit area. Somebody had been kind enough to leave an immense pile of split kindling, neatly stacked and covered. It was too early for us to stop for the day, though. A further 2 km down river we arrived at the next major rapid, which was described as a 600 m class 2 with a 656 m portage on river left. 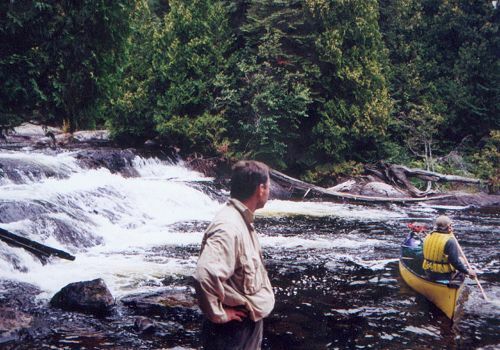 By this time in the day, we weren't looking forward to a long portage, so we were hoping to find a runnable rapid. We rounded the corner to find a seemingly endless section of river with thousands of exposed boulders - a real canoe eater. We considered the options of portage vs. lining and wading, and chose the latter. It took an hour of running, eddy-hopping, wading, lining and pulling canoes to pick our way through the long rapid. The next rapid (at about km 74) was described as a P 218 mandatory, with two ledges and large boulders. We waded through the first section, which had two small ledges; then got to a pool section that we paddled. The second part of the drop was a pretty boisterous class 2 or 3 run with large ledges and lots of boulders. It was definitely not runnable. We scouted both the right and left sides, and eventually chose to line down river left. We arrived at km 77 at around 6:00 and had a discussion about whether to stop for the night at the campsite we found there, or whether we should go on to our planned site at km 80. The site looked quite presentable, and the ones further on were a bit iffy. With our gear still soaked and sandy from the terrible site the night before, we decided that we would rather stop a bit early, get up some clotheslines and take advantage of the remaining sunny weather to dry them. The site was up at the crest of a smooth, rocky slope. There was really no takeout, nor was there anywhere to pull the canoes out to leave them overnight. We hauled the gear up the rocky slope and left the canoes well-tied and floating in the river. The campsite was quite nice, with a good firepit and seating area. It appeared to be one of the few that got regular use. Somebody had hauled in a plastic patio table, which was handy to use for our kitchen. Tent sites were ok, but not great. We set up 3 tents easily, but 4 might have been a bit of a stretch. We had stopped 3 km short of our planned goal the night before, which was going to add to an already ambitious day. We needed to get through to the campsite at km 109, a distance of 32 km. In that 32 km stretch were 17 marked rapids and innumerable smaller rapids and swifts. We were facing a busy day, to say the least. We made it through the first two rapids we encountered by running and/or lining. An unmarked, simple zig-zag rapid followed this, which we also ran. A further 2 km downstream was a rapid with large ledges and boulders marked as a mandatory 328 m portage in our trip notes. We ran the small chute at the start and eddied out into a pool at the middle of the run. From this point, the ledges were large and unrunnable (and unlineable). We could have possibly lifted over a small rock island in the middle, but the footing was very slippery and precarious, and a slip would have meant a very bumpy swim. Instead, we chose to bushwhack over to the portage on the left side, and carried everything for the remaining 150 m. The portage consisted of a very faint, overgrown trail that was in need of major maintenance. The rapid marked as P23 was in two sections, both lined down the left side. It was beginning to look as if we were not going to find any runnable whitewater on the trip. The time spent scouting, lining and wading was putting us further behind schedule as each hour passed. It was already 11:30 am. We had been on the water 3 hours, and had made exactly 4 km of progress. At this rate, it became clear that we were not going to make our ambitious 32 km unless a miracle happened. From this point, my trip notes fall apart. We spent the next 8 1/2 hours running, bumping, lining and wading through and endless succession of rapids and swifts. Thankfully, the rapids became shorter and simpler, and we simply endured the banging and bumping as we picked our way through the exposed boulder gardens. It was more like bumper cars than canoeing. We left behind a steady trail of Royalex shavings as we went. We ran everything we could, and when we ran out of water we got out and heaved and pushed. There were two possible sites mentioned in the trip notes at about km 107, but we could find neither. It was decided that in spite of the late hour (7:30 pm), we should push on and get to the site at km 109. The last tribulation of the day was the rapid marked as P33, which was bypassed on the right by an 82 m portage. By this time, we were rapidly running out of daylight, and the overgrown portage would have been completed in the dark. We managed to line down the right side of the rapid, but it was a strenuous exercise at one point, when a huge ledge had be be bypassed. The drop was far too high to line without swamping the boats, and there was insufficient room to ferry across to the other side. We eventually managed to heave the fully loaded canoes up out of the water and over a precarious rock step to bypass the ledge, then lined the remainder and hopped in to be flushed out at the bottom. At just after 8:00 pm, we arrived at our site just as darkness fell. The 'campsite' was actually a grassy field in the middle of a three-way logging road intersection next to a Bailey bridge. Trucks and cars were parked around the perimeter. We set up in the triangle-shaped grass area in the middle of this intersection, ate a quick supper and sat around discussing the grueling day we had just completed. It was certainly not a pretty site, but at this time of the night, it suited us just fine. All we wanted at this point was a flat spot to put up tents and a place to sit and rest our weary bones. delicious! A spectacular display of northern lights rewarded us for our days hard work, and we fell into bed exhausted at 10:30 pm. After 32 km and a 12 hour paddling day, we'd had enough. This was to be our easy day, a 20 km flatwater paddle down to Lake Wanapitei, where our wives were going to meet us and bring us home. There were a few rapids, swifts and gravelly fast water sections in the first five kilometers - all were runnable with a bit of bumping. There were also a number of shallow, gravelly sections where the water level dropped to mere inches. We bottomed out in almost all of these sections and had to get out and drag the boats. The river eventually widened and deepened, and we had a nice flatwater paddle out to the lake. The water was as flat as a sheet of glass, and the weather was warm and clear. By the time we reached Wanapitei Lake around noon, the weather went beyond warm and was actually very hot. We sweated our way across the seemingly endless 5 km run to Rocky's, the restaurant where we were ending our trip. Thankfully, the lake was calm and winds were almost non-existent. Wanapitei can be a tough (if not impossible) lake to paddle if westerly winds are present. We pulled out at Rocky's at 12:30 pm, had a swim and went into the bar for a cold one while we waited for our spouses to pick us up. We went into this trip knowing that it was primarily a spring run, and were not expecting great water levels and 100% runnable whitewater. However, even up to 3 days before our trip, water levels were adequate and we would have done fine. The sudden drop just before we left resulted in a pretty tough slog down the river. Thank God (and Dupont) for Royalex. Had we left for the trip in fiberglass or kevlar, the canoes would have been totally finished by the end of the trip. If you want to do the train access like we did, you have to be prepared for two full days of paddling winding oxbows through marshy area. Personally, I liked the section and found it quite nice scenery with lots of wildlife, birds and plant life, but those interested primarily in whitewater paddling would die of boredom. After two days, even we were more than ready to get out of that area and into some straight river. Campsites are few and far between, and those that exist are pretty rudimentary. This makes trip logistics a bit difficult, since there are only a few places you can stop for the day. For example, we had to do a shorter than average first day; and then longer that average days following that simply because that was the only site available. The route sees little traffic. Portages and campsites were overgrown and had obviously seen little use this year. We were only the third group to put in at Lou's camp this season that he knew about. We saw no other paddlers, and the first motorized traffic we saw was in the last 7 km of the trip as we approached Wanapitei Lake. Intermediate access to several points along the route would be possible at various Bailey bridges on the logging road network, but lengthy shuttles would be required. Expect to share the route with the logging industry. A logging road touches or parallels the route for at least one-third of the trip, and you will see trucks. There will be sections of whitewater that must be run because no portages exist. This means that in times of high water, you should have good whitewater skills; and it times of low water, you had better be well-versed in wading and lining some difficult sections. There were a few drops that were a bit wild to line, and the very slippery boulders that make up the riverbed make life particularly difficult for wading. Allow enough time. A week below our trip, I spoke with a friend who made it through the route in four long days with his wife and young daughter. The lining, wading and portaging required on our trip made it a challenge to complete in the five days we had. Were I to do the route again, I'd allow a week and spend any extra time on brushing out portage, clearing deadfall and doing general maintenance. This trip should be paddled in the May or early June when water levels are reasonably high. The MNR Publication "Canoe Routes of Ontario" lists the MNR Sudbury office as the contact for obtaining the route description, but they will not send out the documents, claiming that the route is no longer maintained. I managed to get a copy by begging someone at MNR Ottawa who obtained it from the archives. For this reason, I have put quite a bit more detail on the route description than I normally do. Thanks to Sharon van Valkenburg from New Liskeard for sending me her trip notes. Sharon and her group paddled this section in June of 1995 and verified most of the portages and campsites along the route. At the time Sharon did this trip, portages and campsites showed no sign of previous use that year, so the route probably gets very light use.